We're giving away 100 limited edition Smite skins! We're giving away 100 keys for Smite god Nu Wa's Odyssey 2016 skin, 'Nu Horizons,' and you can enter to win one! 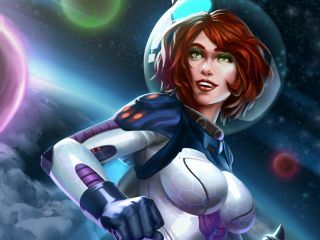 This is a limited edition skin that's part of Smite's Odyssey 2016 event, and is only available to buy in-game until January 7th, 2016—at which point it will never be sold again, and the only way to get it will be from random chests throughout the year. What's more, the keys we're giving away will unlock both the skin and Nu Wa herself, so you don't even need to have her unlocked beforehand. To enter for a chance to win a key, enter your email in the widget below (or at this link). Simple as that! We'll be picking 100 random winners and sending keys out to the email address you've entered (so make sure it's correct) on Monday, October 26 at 12 pm Pacific. Additionally, the key will only be redeemable if you are playing on Hi-Rez's servers, meaning players from China and Latin America/Brazil won't be able to use it. Good luck! The Smite Odyssey 2016 event is still in full swing, and you can find more information about it right here.